Hearty congratulations to all the newly elected principal officers of the eighth national and state assemblies. It will be recalled that sequel to the March 28 and April 11, 2015 elections which produced new members of the Senate, House of Representatives and state Houses of Assembly, political parties of these members had organised retreats for them to share with them their expectations. In the same vein, the National Institute for Legislative Studies as well as Policy and Legal Advocacy Centre, Abuja had also organised trainings for them. It is my sincere hope that the knowledge imparted on them at the series of training and retreats will be put to good use. 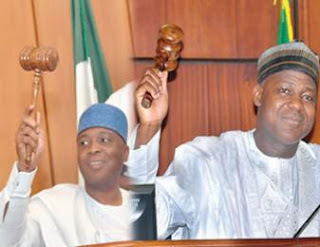 With the inauguration of the legislative arm at both federal and state levels as well as the emergence of principal officers (Senate President, Deputy Senate President, Speaker House of Representatives, Speakers, state Houses of Assembly, Deputy Speakers, Majority Leaders, Minority Leaders, Chief Whips, chairpersons and vice chairpersons of various committees) after much horse-trading and power play, it is now time to institute good governance and deepen our democracy. The principal officers and indeed all members of the legislative arm should cease to see themselves primarily as party men and women but as representatives of the people of Nigeria. If truth be told, Nigerian legislators are seen more as parasites on the country’s economy. They are routinely criticised for earning so much for doing little work. The Seventh Senate said it passed 123 bills in four years but 46 of such were passed on the eve of its departure causing people to ask why the lawmkers filibustered on the passage of those bills till the twilight of their tenure. People have also asked why many of the bills that would help promote good governance such as the Petroleum Industry Bill were not passed into law. It is heartwarming that much of the leadership crises that rocked previous National Assembly did not manifest in the last one. Former Senate President David Mark and all of his principal officers as well as former Speaker Aminu Tambuwal and his principal officers held their positions for four solid years since their inauguration in June 2011. They managed to navigate their way round the proverbial banana peel that had accounted for the fall of many of their predecessors. It remains to be seen how the Eighth National Assembly will be able to maintain that track record given the intrigues that played out ahead of the elections of its principal officers. It is very distasteful that many state Houses of Assembly were rocked by leadership crises during the last session. Notable among them were Ekiti, Enugu, Rivers, Taraba and Edo states. It is a sad commentary on our national life that in more than half of the state assemblies, principal officers were routinely changed over flimsy excuses. It is however noteworthy that many of the crises witnessed in both the national and state assemblies were sponsored mostly by the executive arm, especially the governors who ruled like emperors or Lord of the Manor. Many of Nigerian governors brook no disobedience to their orders to the state Houses of Assembly. Any Speaker who is unwilling to carry out the governor’s command is deemed disloyal to the government and has his or her removal stage-managed. Similar stories abound at the national level especially during the administration of Olusegun Obasanjo under whose tenure between 1999 and 2007, the Senate had five presidents. (Evan Enwerem, Chuba Okadigbo, Pius Anyim, Adolphus Wabara and Ken Nnamani). The political parties under which some of the lawmakers were elected also contributed in no small measure to the instability experienced in many of the legislative houses. It is on record that the Peoples Democratic Party in a bid at demonstrating party supremacy wanted Mrs Mulikat Akande Adeola as the Speaker of the House of Representatives in the last dispensation. The lawmakers revolted and voted en masse for Aminu Tambuwal. A similar scenario has also played out in the Eight National Assembly where by sleight, the party wanted its members to vote for Senator Ahmed Lawan as Senate President and Femi Gbajabiamila as the Speaker of the House of Representatives. As it turned out Tuesday, the members rebelled and voted instead for Bukola Saraki and Yakubu Dogara as the Senate President and Speaker of the House of Representatives respectively. The political crisis that engulfed the Ekiti State House of Assembly after the loss of the APC in the governorship election of June 21, 2014 to the PDP’s Ayodele Peter Fayose is traceable to the APC whose lawmakers deliberately made the state ungovernable for the new helmsman by serving him an impeachment notice. My advice to the legislative houses at the federal and state levels are as follows: Members should work for national interest and not parochial or sectional interest. It should be Nigeria first before any other considerations. Second, new members should familiarise themselves with the provisions of the 1999 Constitution particularly as enunciated in Chapter Five which deals with the Legislature. They should also read and digest the House Rules guiding the activities of their assemblies. Third, much as I do not want them to be a rubber stamp legislature or an assembly of “Yes Men and Women”, they should also ensure that their relationship with the other arms of government especially the Executive is not adversarial. The roles of the three arms of government are clearly spelt out in the Nigerian constitution which is the ground norm and each is expected to serve as checks on the other. Invariably, much as the presidential system of government which Nigeria runs promotes separation of powers, it also institutes checks and balances to prevent one arm becoming overbearing over the others. I also enjoin the newly inaugurated lawmakers to be dutiful, conscientious and painstaking in their deliberations. They should not be absentee lawmakers and should shun personal aggrandisement and scandals which dogged previous assemblies. They should cut down on their vacations and work to ensure that no bill spends more than one year or a maximum of two years before they are passed. It is disheartening that many bills spend four years before they sail through; this is not good enough. Furthermore, our legislators should also ensure a prompt decision on the list of appointees sent to them from the executive, take their oversight functions seriously and come up with motions that promote public good. If they fail to be good representatives of the people, they must realise that the constitution has given the electorates power to recall them and if that is not feasible, it will soon be another general elections when they will seek to renew their mandate.